Recently I attended an amazing event called "Femme Appetit" where I was able to meet so many wonderful and talented women. The purpose of the event was for women to work in groups and come up with dishes that could feed the larger group with limited space, time and tools. It was choatic, sensorial and beautiful all at once. After we created our vegan dishes, we were able to sit around the table and enjoy the delicious spread with strangers. I sat next to Marjorie Joys, co-founder of Avenue Petit Lou. From the minute we started talking I knew she would be someone I would click with. Her vulnerability, honesty, authenticity, courage and let's be honest...her French accent, had me hooked. As I began talking to her about her life's journey, I realized that she would be the perfect candidate for my lady boss page. Someone who has taken risks, has strength despite roadblocks and a mamapreneur! I hope you enjoy getting a taste of Marjorie's life just like I have! Read below for my interview with her, a special discount on the fall collection and to see the inspiration behind her Senorial Mood Wheel, which I created for her and her company. How did the idea come about for avenue petit lou? Marjorie and her mom, Anne-Marie Martens. For years, my mom and I had wanted to get into a children's boutique together which was organic and all natural. Once I quit my full-time job, I decided it was now or never. We started by collaborating on a book called "The twins Mia and Mateo: Daddy's little helpers." We had no idea that it would turn out to be such a hit and even win a "Living Now" award once it was published. We have plans to bring the characters to life through toys, clothing and other fun children's items. The award winning book: The Twins Mia & Mateo: Daddy's little helpers." NOTE: I did ask Marjorie if she thought the characters would taste good as ice pops. And we had a good laugh about that! But seriously, wouldn't that be fun! After the book, we began to expand our online store. In order to do this effectively and to build brand awareness, we decided to collaborate with other organic and natural children's brands. So in addition to carrying our own brand, we feature other brands that we are in love with that fit our mission (organic and natural). We are selling a variety of children's products organic and natural. Most of them are handmade. Our products are earth friendly and made with recycled materials. Being conscious of where, how and what our products are made of is a priority for our company. Children's should have non-toxic toys, clothes, dinnerware, etc. We sell products that we, the owners, would use in our households therefore I have no problem vouching the health benefit, the quality and their low environmental impact. I love looking for new products, finding new companies to work with and creating new business relationships around the world. Our ideal customers should feel confident they purchase a quality products with as little impact on Mother Earth as possible. Their children will enjoy the non-toxic organic and/or natural product and be safe with it no matter if they snuggle, eat or play with it. My brand would smell like earth, bamboo, and leafy with a sweet cuddly bunny smell! Our brand look is woodsy. Our main theme is woodland animals. Bear, deer, raccoon, bunny and all our forest friends. Our brand would taste like a breath of fresh air - that deep breath you take when you know the air is fresh and clean and the feeling your body and senses are experiencing right after that breath. Clean! Our brand would sound like woodland fairies laughing and having a concert with flowers, bees and other forest animals. What is your Favorite product you carry? I would have to say the Dinosaur tails. These tails were accidentally popular! I initially created them for Bryce's birthday. Instead of giving out candy to the guests, I decided I wanted to give the children a unique and handmade gift. I was up all night putting together these cute tails. The children loved them. The next week the mothers were asking about these tails at school. I then realized I should sell them on our website. What about your son Bryce? 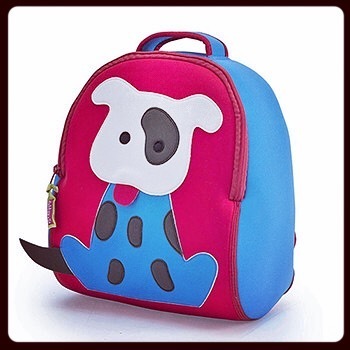 He loves the Bisou Boy Dolls and the Dabbawalla back packs! P.S. 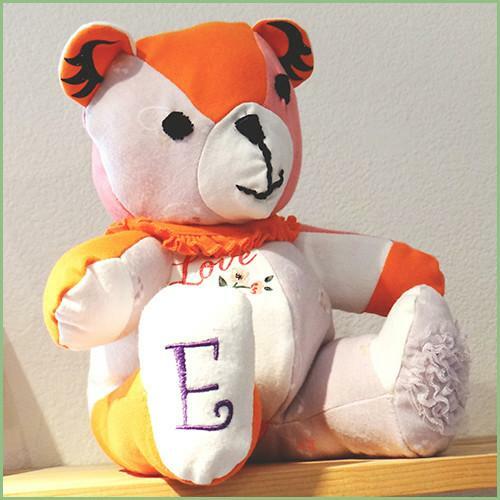 My favorite product might be the Keepsake Teddy Bear! Check it out. You can send your child's old clothes and they will turn the fabric into a Teddy Bear!!! I'm ordering for the grandparents asap! What is the toughest part of being a single mamapreneur? Prioritizing and balancing it all. When I have tons of emails, orders to be fulfilled, marketing stuff to accomplish...it can all start to feel overwhelming! Guilt is present a lot. I feel like I should be spending more time with him. But I have to make a choice. I can't work until 4 a.m. every night. Sometimes that means that I can't spend as much time with him than I would like. What kind of advice would you give to other single moms about this guilt? Its not really advice but something I have experienced is that I will have these moments where I feel I have so much work to do and it will be the same day that Bryce only wants me. In that moment, I know I have to make the decision to be his mom and put aside my work, hoping nothings falls through the cracks. By making that decision, I can relax, because I know my number one priority, my son, is taken care of. Still, the best way for me to truly be present with him is to leave the house completely, so I am not tempted to do any work! Never give up, no matter how tough some days feel. New business demands so much out of you, do not forget to take time off for you! You can't please everyone. There will always be someone unhappy with your goods or services. Do not take it personally! For being a fan of the lady boss page and for getting to know Marjorie, she is offering a 15% discount on any product in the FALL COLLECTION. When checking out, use the code LADYBOSS15%. Hurry, this offer only lasts through Sunday, October 1st!